December 16 marks the beginning of Las Posadas (a novenario, nine days of religious observance), during which Mexican families participate in nightly Christmas processions that re-create the Holy Pilgrimage of Mary, Joseph and the baby Jesus on their way to Bethlehem. 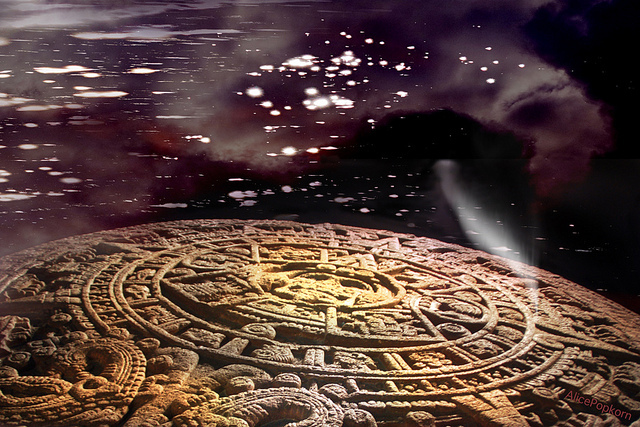 In Mexico, the Aztec winter solstice festival had traditionally been observed from December 7 to December 26. According to the Aztec calendar, their most important deity, the sun god Huitzilopochtli, was born during the month of December (panquetzaliztli). The parallel in time between this native celebration and the birth of the Christ lent itself to an almost seamless merging of the two holy days. Seeing the opportunity to proselytize, Spanish missionaries brought the custom of the re-invented religious pageant to Mexico, where they used it to teach the story of Jesus’ birth to Mexico’s indigenous people. In 1586, Friar Diego de Soria obtained a paper bull from Pope Sixtus V, stating that a Christmas Mass (misa de Aguinaldo), be observed as novenas on the nine days preceding Christmas Day throughout Mexico. The nine days of celebration mark the nine months that Maria carried Jesus in her womb, leading up to Noche Buena (Christmas Eve). Originally organized by the Church, at first these were celebrated as formal masses. With time they became what they are today; festivities which include singing, food and a simulation of the Holy Pilgrimage from Nazareth to Bethlehem, as Mexicans everywhere recreate the journey of the Holy Pilgrims (los Santos Peregrinos) seeking shelter. One of Mexico’s most charming traditions, las Posadas occur between 8-10 pm each night beginning on December 16th and are truly a community affair. 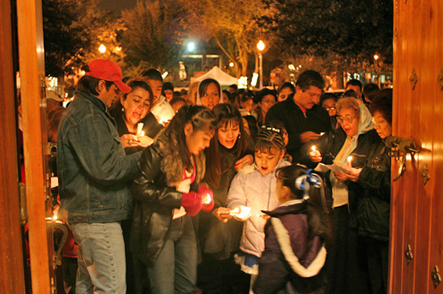 A re-enactment in song, families in a neighborhood each host the Posada at their home on one of the nine nights, playing the role of the los hosteleros or innkeepers. Costumed children and adults are los peregrinos, who have to request lodging by going from casa a casa (literally from house to house, this usually involves 3-4 homes) singing “Villancicos para Pedir Posadas” (“Searching for an Inn” carols), carrying small candles in their hands. Participants either carry statuettes of or may be costumed as Joseph, leading a donkey on which Mary is riding, followed by an assortment of shepherds, angels, and animals, with a star either at the beginning or the end of the procession. As the group travels from home to home, they ask for lodging by singing the appropriate lines of the villancico. At each participating household, the residents (los hosteleros), respond by refusing lodging, with the chorus going back and forth between the two groups. When the Pilgrims reach the designated site for that night’s party, the chorus changes to “Entren Santos Peregrinos” (“Enter Holy Pilgrims”) as Mary and Joseph are finally recognized and allowed to enter. Once the “innkeepers” let them in their home, the group of traveling guests kneels around the Nativity scene and the festivities begin, marked, as in all things Mexican, by song, dance and an opportunity for each household to outdo that of its neighbors. Demand and seizures gave birth to a lucrative new industry, the report continued, [after] “a market vendor named Doña Maria [ a USDA smuggling control officer] how to obtain legal supplies, and he suggested that farmers grow tejocotes domestically”. And so, a successful exotic fruit farmer in Pauma Valley, San Diego County’s Valley Center added tejocotes to his crop. In 1999, Jaime Serrato, who was familiar with tejocotes from his childhood in Michoacán, started grafting trees from bud wood in his orchard and today has 35 acres of trees. 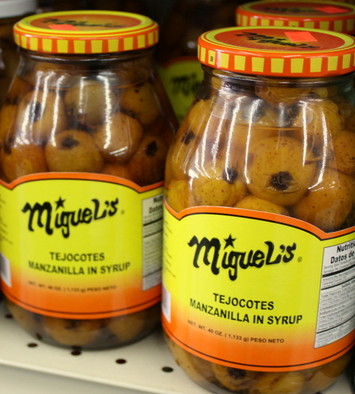 Today, tejocotes can be widely found jarred or canned, and fresh during the holidays in regional Latino markets. A full report appeared in Hispanically Speaking News in 2010. In San Francisco, you’ll find them fresh this time of year at Casa Lucas on 24th at Florida St.
Wash all fruits and cut as required. In a large pot, boil water and add tamarind, hibiscus, star anise, cloves, piloncilli (if using) and cinnamon sticks. Boil on high for 10-15 minutes (if using piloncillo, boil until it is almost completely dissoolved), strain mixture to remove any remain of flowers, spices or tamarind. 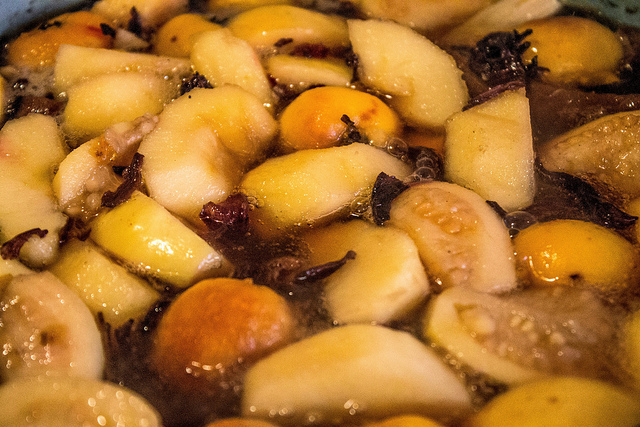 Once strained, add all cut fruits, cook 5 minutes and add dry fruits, and sugar cane. Cook for additional 20 minutes. Serve in a mug or a clay cup, garnished with a sugar cane stick intended to be used as a spoon, and for eating the fruits. Serve warm. Decorate with a half a slice of orange. Optional: add a splash of rum, cane spirit (aguardiente), brandy or event tequila! The consistency can be controlled by the amount of water you use and cooking time. Less water+longer cooking time= somewhat thicker ponche. If you prefer a thinner beverage, add more water. 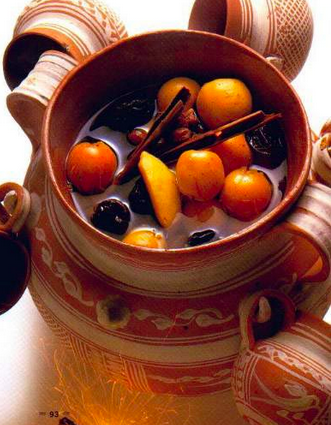 When reheating ponche, you may want to thin with a little water. Keep refrigerated in an air-tight container, will last for at least a week. I like to boil down my leftover ponche until it forms a syrup and serve (with fruit and all) cold spooned over Greek yogurt!